The 50 kg Cerise (Caractérisation de l'Environement Radioélectrique par un Instrument Spatial Embarque) was built by Alcatel Espace and based on the Surrey UOSAT bus. 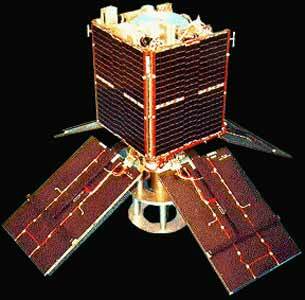 It carried equipment to catalog wideband radio interference and develop technology for an electronic intelligence satellite. Its main purpose was to intercept HF radio signals for French intelligence services. Based on the SSTL-70 satellite platform and with a mass of 50 kg, it was launched by an Ariane-40 H10-3 rocket from Kourou in French Guiana on 7 July 1995. In July 1996 it collided with a piece of orbital debris. Independent analyst B. Gimle suggests the debris piece may have been 18208 1986-19RF. The satellite was observed to suddenly tumble end over end; the debris impacted the 6 m long stabilization boom. The collision tore off a 4.2-metre (13-foot) portion of Cerise's gravity-gradient stabilisation boom, which left the satellite severely damaged. SSTL controllers at Guildford regained control of the satellite using electromagnetic stabilization.